You guys may have noticed from following me since I have had Andi that Nuna products have been some of my favorite. 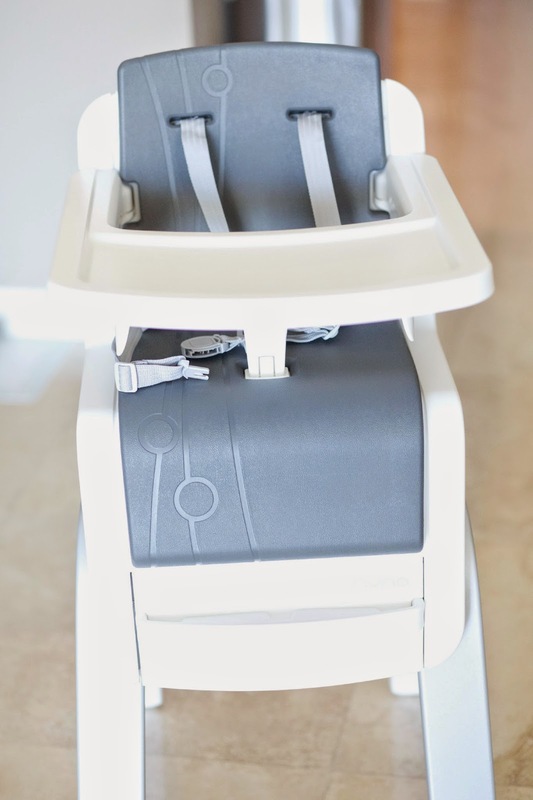 I discovered Nuna when I was pregnant and searching for a car seat. I found the Nuna Pipa and purchased it and it seriously is the best car seat! So I wanted to try some of their other products as well. I now have all of the products pictured above! 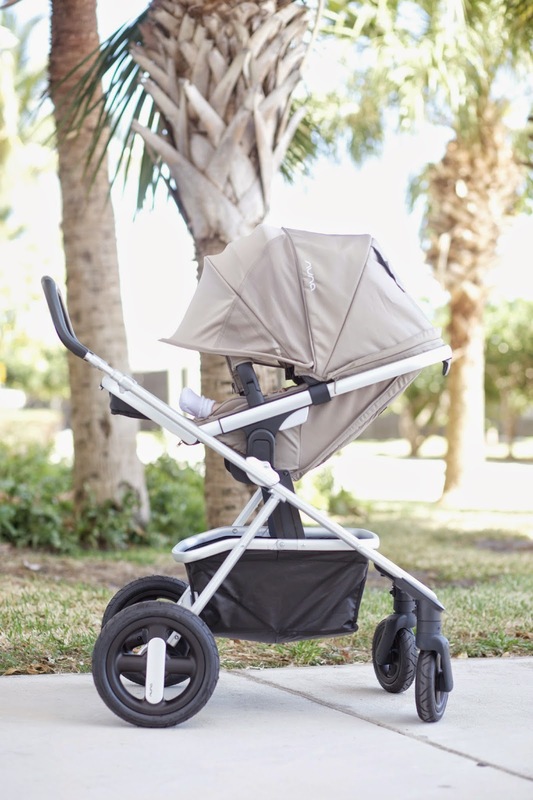 The Nuna IVVI stroller, the Nuna Sena pack and play, the Nuna Leaf, and the Nuna Zazz highchair. I love ALL of them. I haven't been able to use the Nuna Zazz Highchair yet because Andi is still too small. But I love the functionality of it. 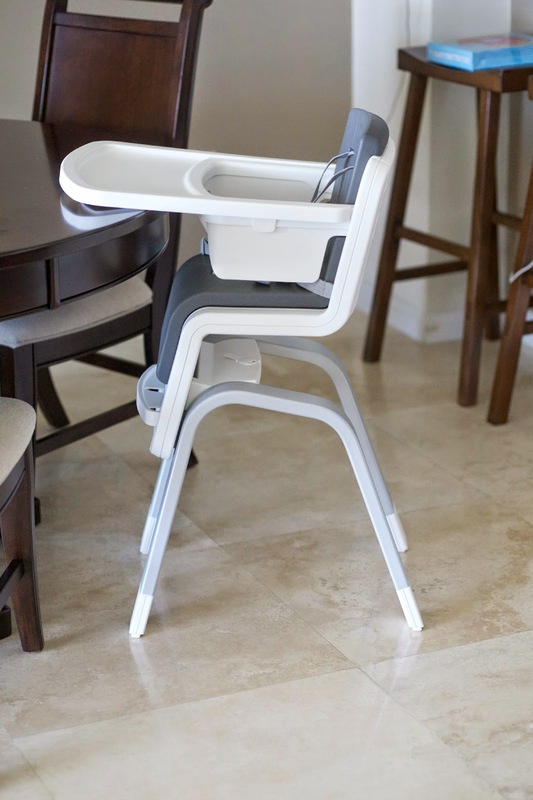 It was super easy to set up and I love that it is a "modern looking" highchair. The IVVI stroller is amazing. I love the seat on it. It is so comfortable for Andi and I can tell she just loves it. It has a huge canopy already but then it unzips and it gets even bigger, which I really love because it is so sunny here in Florida. With other strollers, I usually have to drape a blanket ovet it so the sun doesn't hit her when we go for walks, but not with the IVVI. It also has a huge basket which really comes in handy! 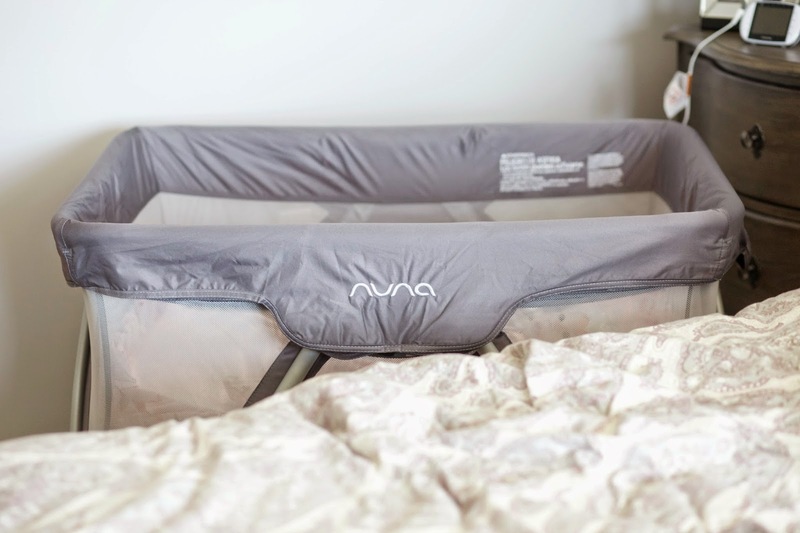 The Nuna Sena Travel crib is something we just started using and we love it. It is really easy to open and close. Andi sleeps in her crib at night but it is nice to put her in this to nap or even when she is awake just to play while I am doing other things. I know she is safe in it. and I really like the color! 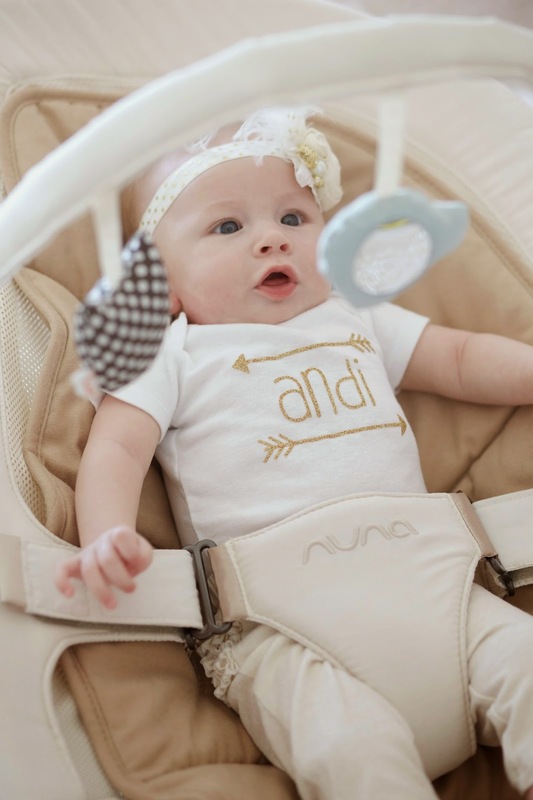 Andi loves the Nuna leaf! And so do I! I love that it doesn't get plugged in so you can move it anywhere and it is light and easy to pick up. If I am in her room doing laundry I just pick it up and bring it in there with me and she will just hang out in it. Now on to the fun part! Today I have teamed up with Nuna for a seriously great giveaway! ONE winner will get to choose ONE of the following items in the color gray: The Nuna IVVI, The Nuna Sena, The Nuna Curv or The Nuna Zazz. Like I said all of these products are seriously amazing! To enter use the Rafflecopter widget below. You must complete all items on the entry list to be entered. The giveaway will end on April 12th at midnight. Good luck! Andi looks so cute! Love all her cute clothes! Your baby is so cute! And I love your outfit! http://trendkeeper.me .. March Favorites & get featured! You are the cutest little mama ever!! Nuna is the best! I need that Leaf in my size! these products are amazing! were due in june and i know some would be super helpful! This would be fabulous, I've heard wonderful things about Nuna! 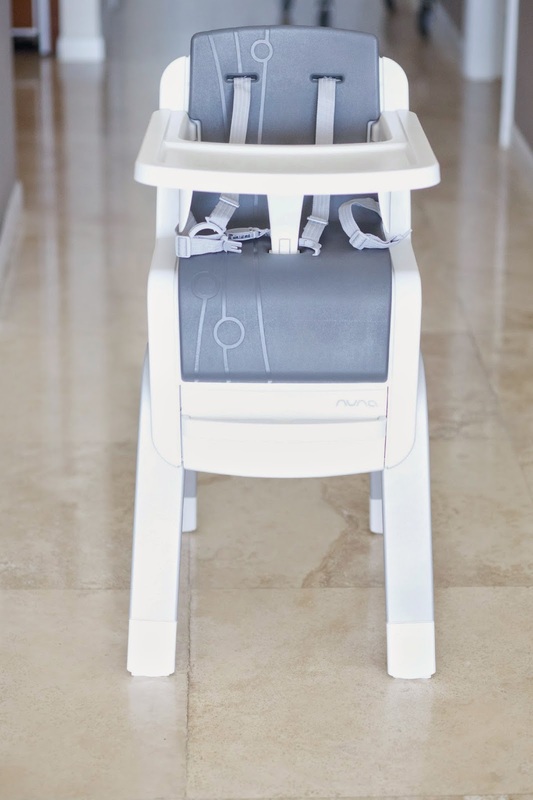 We have the nuna highchair for a few years and its amazing, but we are having our fourth baby this September and could definitly use some new products. Especially since after three beautiful boys we are having a baby girl!!! I would love to spoil her with any of the nuna products!!! I love, love, love them! Love Love Love! Beautiful little girl & great blog! Love following you and the blog! What is GFC? When I click on it it brings me back to your blog, I dont want to miss the last step in the giveaway! As a girl almost done with her first trimester, I am excited to hear about products that other mommy's love! Definitely keeping my eyes open for Nuna products! Love this collection....I've had my eye on this car seat and stroller....fingers crossed!! Where did you get Andi's onesie? I don't have the last two entries. This giveaway is amazing I'm crossing everything this would be a blessing. Truly a great giveaway! Eek! Hope I win! What an AMAZING giveaway! They have the coolest products, the stroller and highchair are on my wish list for our baby due in June. What a fabulous giveaway!! I've been so curious about the Nuna brand ever since I've seen your posting on Insta. I hadn't actually heard of it before until then. How wonderful to have the whole family of products. Fingers crossed that I win. I entered all the different ways you provided. Love your style and little Miss. Andi is a doll!! I LOVE, LOVE, LOVE that stroller. Thanks so much for the giveaway!